Thackeray spent his formative years at the Charterhouse, which he parodied in his later fiction as “Slaughterhouse”. William Makepeace Thackeray (18 July 1811 – 24 December 1863) was one of the great English novelists of the 19th century. He is best known for his satirical works, particularly Vanity Fair, in which he lampooned English society while retaining his distinctively light touch. Thackeray was born in Calcutta, India. His father, a secretary to the board of revenue in the British East India Company, died in 1815, and as a result Thackeray was sent to England to begin his schooling. He was educated at schools in Southampton and Chiswick and then at Charterhouse School, which he disliked, later parodying it in his fiction as “Slaughterhouse”. After Charterhouse, Thackeray struggled to find his way in life. He did not finish his studies at Trinity College, Cambridge, nor his studies to become a barrister at Middle Temple. Although his father had left him a small legacy, Thackeray squandered much of it on gambling and by funding two unsuccessful newspapers, The National Standard and The Constitutional, for which he had hoped to write. Forced to consider a profession to support himself, he turned to art, which he studied in Paris. Nevertheless, he did not pursue it except in later years as the illustrator of some of his own novels and other writings. Thackeray’s years of idleness ended when he married Isabella Gethin Shawe on 20 August 1836. Thereafter he began “writing for his life”, as he put it, turning to journalism in an effort to support his young family. He worked primarily for Fraser’s Magazine, for which he produced art criticism, short fictional sketches and two longer fictional works, Catherine and The Luck of Barry Lyndon. In 1840, after giving birth to the couple’s third child, Isabella entered a terrible depression. Finding he could get no work done at home, Thackeray began to spend more and more time away, until finally, in September 1840, he realised just how bad his wife’s condition was. Struck by guilt, he took his Isabella to Ireland in a misjudged attempt to resolve the situation. During the crossing, however, Isabella threw herself into the sea, and had to be pulled from the waters. Shortly after, her mental condition deteriorated into a permanent state of detachment. Unaware of the world around her, she ended up confined in a home near Paris, and remained there until her death in 1893. She outlived her husband by thirty years. After his wife’s illness, Thackeray became a de facto widower, never establishing another permanent relationship. All the same, his writing output remained undiminished, and with the Snob Papers (serialised 1846/7), Thackeray firmly established himself as one of the finest writers of his day. 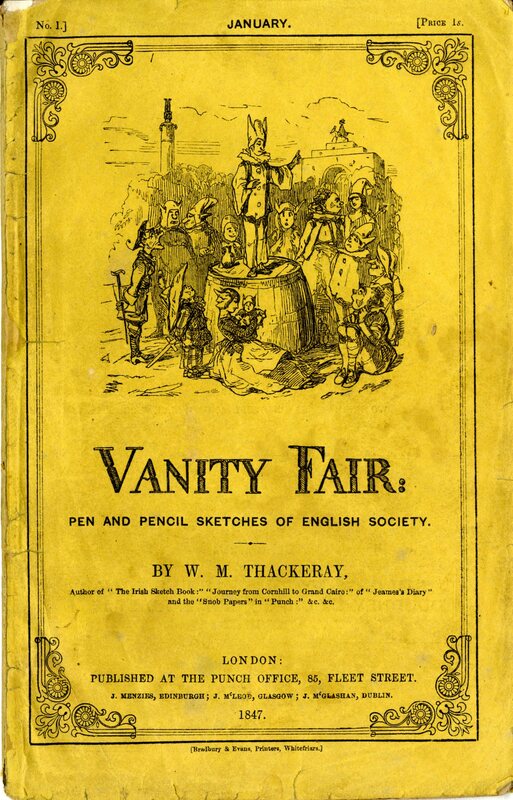 Even before Vanity Fair completed its serial run, Thackeray had become a celebrity: the reading public considered him second only to Charles Dickens, whom he both deplored and admired. Thackeray’s final years were spent producing several large novels, notably Pendennis, The Newcomes and The History of Esmond; giving lectures in London on the English humorists of the eighteenth century; and editing the newly established Cornhill Magazine. He was not a well man during this time, and he was plagued by a recurring stricture of the urethra that laid him up for days at a time. He suffered a stroke on 23 December 1863, aged 52, and was found dead in his bed in the morning. An estimated 7000 people attended his funeral at Kensington Gardens. Notwithstanding his dislike for his days at Charterhouse, Thackeray was honoured in the Charterhouse Chapel with a monument after his death. Over the years the Charterhouse has gathered a wealth of materials relating to Thackeray, including drawings, busts and letters.